Railpictures.ca - Robert Farkas Photo: This string of CLC locomotives headed by CN 2204 is in the CN Reclamation Yard in London, Ontario on November 30, 1968 (Exactly 50 years ago today). Electric 101 to the left of 2204 is from an unknown railroad. | Railpictures.ca – Canadian Railway Photography – photographie ferroviaire Canadienne. 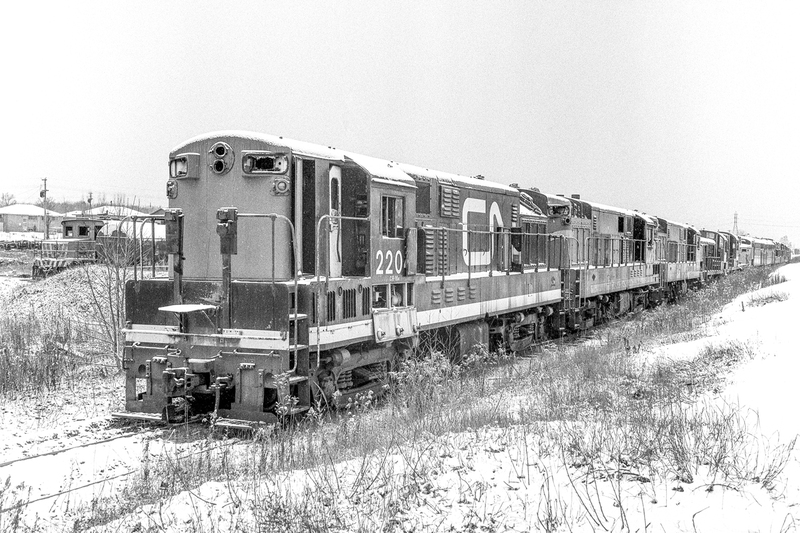 Caption: This string of CLC locomotives headed by CN 2204 is in the CN Reclamation Yard in London, Ontario on November 30, 1968 (Exactly 50 years ago today). Electric 101 to the left of 2204 is from an unknown railroad. When did Reclamation Yard stop being used as a storage site for retired engines? Great image that is certainly somber and historic at the same time. I remember them well at PSC Montreal in 1968 as I was apprentice,they brought them in to remove their twin cramshaft engine and generators and also the traction motors i think ,then they sent the bodies somewhere. Thanks to mercer, I believe that might have been Oshawa 401. Perhaps enough of the “4″ could not have been seen, so I thought it was 101. I think the electric ( steeplecab) could be ex Oshawa Railway 401…??. 400-403 were all cut up at this yard by early 1969. Yes, Mr. Mooney is correct. Seeing a whole class of locomotives go into extinction just doesn’t feel proper. Sad and beautiful at the same time.